I would like to say the highlight of my day was the ” activity ” that I planned but it wasn’t. These kids were funny today. I put several little clips of their hilariousness on my Facebook but I will list here too since I know not everyone follows me. Me: are you going to be a guitarist when you grow up? 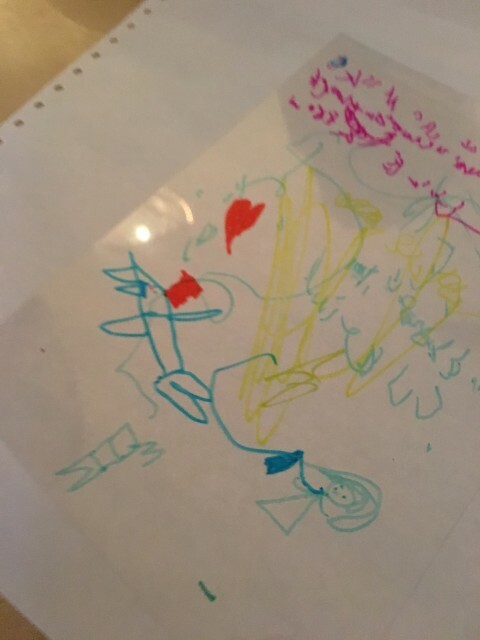 Child ( showing me an autographed art of a 3 year old)- here’s someone’s art I found. Me: I can’t tell who’s writing that is. Child: 15 minutes. She must love us. There was a lot of free crafting today. 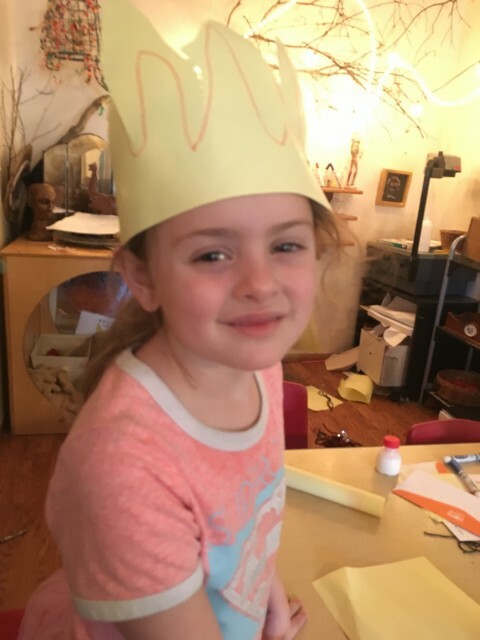 Khloe made this crown and one of the boys made a back pack. Nathan even said to Tryston ” Stop making awesome stuff because when you do they want us to make them one. ” LOL ! We also talked about the puppet show last night. If you want to see what they said there is a live feed video on our group page. I loved right out of the gate how Grayson said ” You can’t see the people.” Other things they remembered that the puppet show had that we have not planned are music and lights. 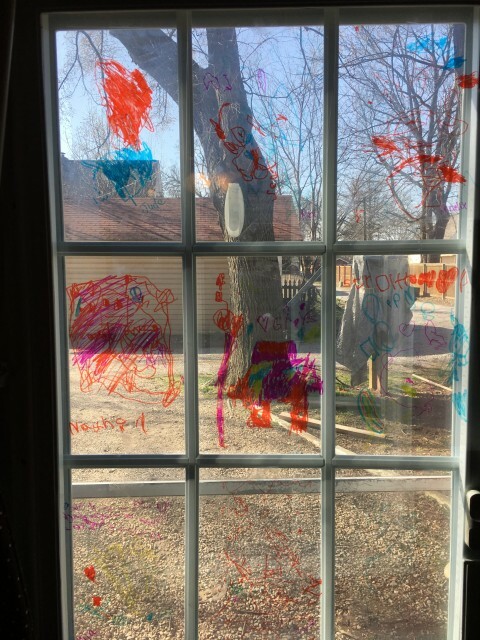 The way a child emergent curriculum works is now that we have talked about this as a teacher I decide what I can do to add invitations or provocations to get them to think about our next step. Will we listen to music to see what fits ? Will we write music like Gracie suggested ? How do you write music ? Do we know anyone here that can write music…. ? 🙂 AH… Do you see where I am going? 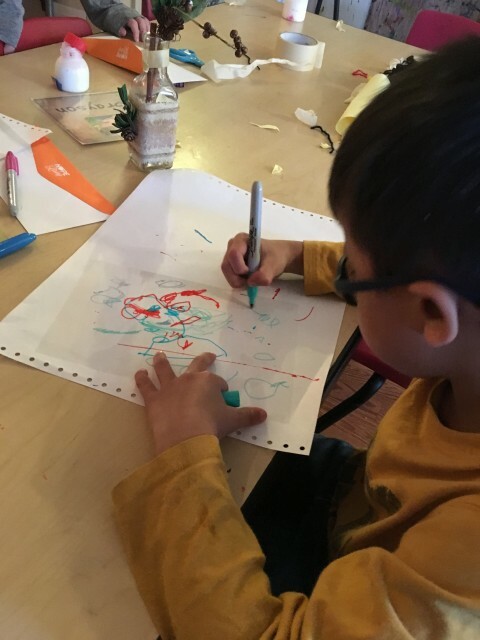 To continue to ” Make Art Meaningful” today we added transparency paper and sharpies to the table. We now have beautiful stained glass windows.